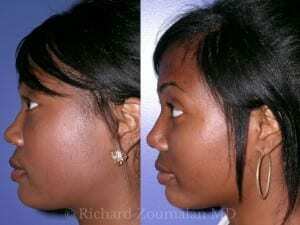 African-American rhinoplasty requires advanced techniques. 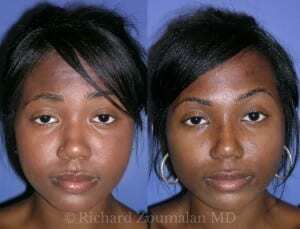 Its most challenging factor is reconstructing tip projection deficiency in the face, as it is usually bulbous and amorphous with thicker skin. Many patients usually have nasal airway obstruction, but preventive measures still need to be taken. Dr. Richard Zoumalan strives to make subtle but efficient improvements, each procedure tailored to the individual. This procedure is done at one of our surgical centers under general anesthesia. Some patients require building up of the bridge, and most require nostril reduction. Dr. Zoumalan does every aspect of nasal surgery and uses all available techniques.